Maca (Lepidium meyenii) is grown at high elevations in the Andes region of central Peru, it has been called “Peruvian ginseng.”. It has been used for centuries by indigenous Peruvians as a food source, as well as for increasing stamina and energy. More recent scientific studies have demonstrated that Maca supports hormonal balance and both male and female reproductive health. Maca is a root that belongs to the radish family, is most commonly available in powder form. Maca’s benefits have been long valued, and has recently been popularized as a supplement and food ingredient. 1. Vitamins- Maca is rich in vitamin B vitamins, C, and E. It provides plenty of calcium, zinc, iron, magnesium, phosphorous and amino acids. 2. 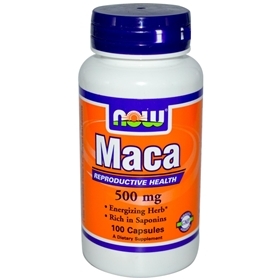 Sexual function- Maca is widely used to promote sexual function of both men and women. It serves as a boost to your libido and increases endurance. At the same time it balances your hormones and increases fertility. 3. Women’s health and mood- Maca relieves menstrual issues and menopause. It alleviates cramps, body pain, hot flashes, anxiety, mood swings, and depression. If you are pregnant or lactating you should avoid taking maca. 4. Energy- Within days of using maca your energy level may increase. It is also known for increasing stamina. Many athletes take maca for peak performance. If you find yourself tired most of the time, experiment with maca to see if it helps. Just a small amount could be exactly what you need for a boost! 5. General health- Maca helps your overall health in a number of ways. It supplies iron and helps restore red blood cells, which aids anemia and cardiovascular diseases. Maca keeps your bones and teeth healthy and allows you to heal from wounds more quickly. When used in conjunction with a good workout regime you will notice an increase in muscle mass. 6. Skin- Many people take maca for skin issues, as for some people it helps to clear acne and blemishes. Another benefit for your skin is that is decreases sensitivity. In hot or cold weather, maca may help your skin withstand extreme temperatures. 7. Mood balance- If you find yourself overcome with anxiety, stress, depression or mood swings, maca may help alleviate these symptoms, though of the evidence is anecdotal. Some have reported an increase in mental energy and focus. Suggested Usage: As a dietary supplement, take 1 capsule 1 to 2 times daily. Consider taking this product in combination with NOW® TestoJack 100™, Tribulus and ENERGY.